Here’s a hand from a PokerDome satellite I played today. Blinds are 75/150 and I have 2250. I am dealt Ah Ad on the button. Lovely. A middle position player who has about twice as many chips as me raises to 300. A fantastic minimum raise. I strongly suspect he doesn’t have aces here, and if he does well that’s just the way cards are falling for me lately. I reraise, making it 900 to go. If he’d made a proper raise I could think about smooth calling here in position, but I can’t let the blinds see a cheap flop. So far so good I think. 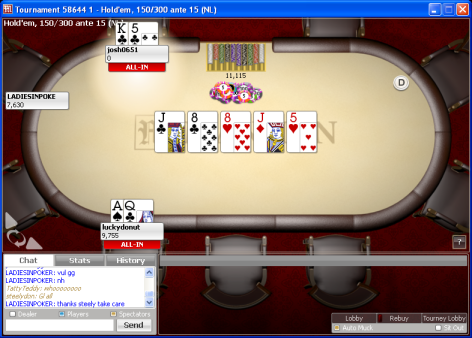 He makes the call and I see a horrible flop: Jh Qd Kc. The only good thing I can say about this flop is that it’s unsuited. 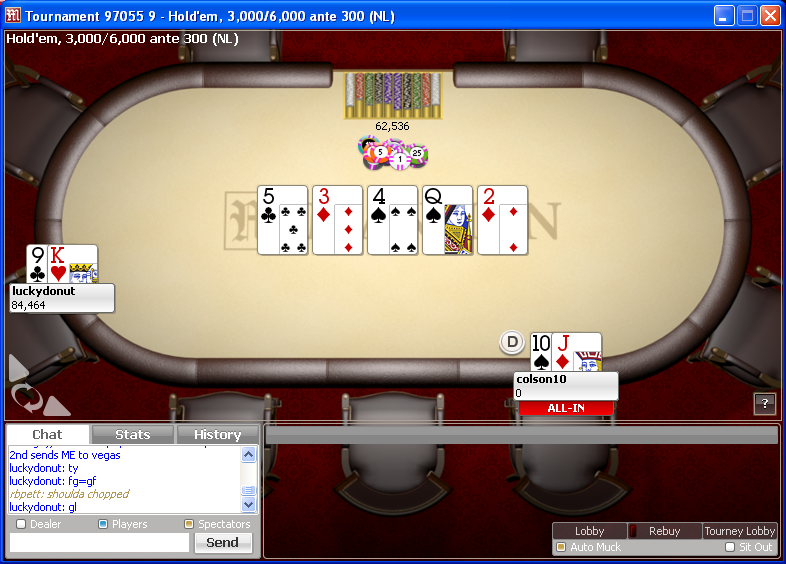 It’s still about the worst flop ever for pocket aces in a pot that saw two raises pre-flop. All those big pairs that you had crushed have suddenly caught up. I figure two Kings would want to apply more pressure pre-flop, but can’t count on it. Two Jacks could get away from this but, in the hands of a big stack, could very likely wait for a low board before hanging themselves. There are also legitimate two-pair threats, and I haven’t been paying enough attention to know whether this guy would call a reraise with KQ, KJ or QJ out of position. You’d hope not. Of course, what I’m really hoping for is to run into AK here, but there’s only two aces and three kings left. It’s unlikely. There’s even the possibility of a maniac with KT who is not going to go anywhere, and would be just about correct to call for pot odds if I move all in. I’d still be a 2-1 favourite, but I wouldn’t like it. TT would have a hard time folding here too, figuring he may have 10 outs, when in fact a ten is no help and two of his straight cards are in my hand. Of all the likely hands that just got much stronger, TT is probably the least dangerous. But you’re still going home against it one time in four. The stacks are nowhere near deep enough to have any chance of finding out where I stand. And not only is the other guy wearing shades, he’s also playing on the Internet – no tells here. I have one pot-sized bet left in me, which I think is probably going in the middle whatever happens. So I’ve decided I’m not folding. I mean, really, how can I? Villian checks the scary flop. Doesn’t matter. He checks if he’s strong. He checks if he’s as scared as I am. There’s no more information to be had. Now here’s the reason I’m posting this hand. I’ve don’t ever remember being in this situation before, and if I have been I certainly didn’t think about it this way. I’m in position, with a hand that could very well not be best any more but unable to find a way to fold. I check, and check with a reason. I’m ever so briefly a little bit smug. If I’m beat I’m beat. I’m losing my stack. If I’m winning and I move all in here, he’s going to be able to fold anything I beat, except maybe AK. He’s not folding anything that beats me, but will also be hating that board with any strong hand. By checking I bring on a free card that probably won’t matter, and encourage him to bet the turn. Which he will now probably do with any hand that pisses on mine, but me may also take the opportunity to push with that AK, which suddenly looks more attractive, or bluff with an underpair or a straight draw, or perhaps AQ or AJ. I’m not saying this thinking is perfect. It probably isn’t. I need to find a way to get away from my aces if they’re no good, and maybe I could have controlled the pot size pre-flop better in order to be able to do that now. I’m also not saying that I put him on a hand I beat and checked to induce a bluff. That’s not possible here. All I can do is make sure that I get as many chips in the middle the times I’m actually ahead as I do the times when I’m toast. It’s the wrong decision. He moves all in on the turn (couldn’t be more of a brick: 2s) and I call. He flips KQo, I hit a second deuce on the river and survive. I eventually bubbled. I’m going to be thinking about this one for a while. It’s a peculiar decision with a reason that’s based on a negative attitude. The decision is not that unusual really. It’s easy to check there out of fear, just as it’s easy to shove your chips in out of panic. I don’t ever recall being in such a horrible situation and having a clear plan. Now I just have to figure out whether the plan was any good. Feel free to chime in anytime. 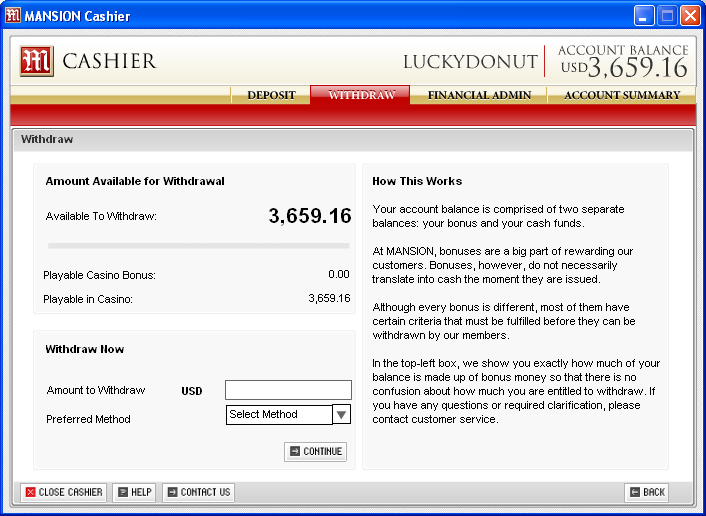 Hooray for me winning through to the Sunday Poker Dome final on Mansion. If I get 1st or 2nd in that bad boy then I’m on my way home to Vegas, to play on TV and in front of a live audience in a converted movie theatre. I’m on a semi-mission with this one. I’ve wanted to play the final for a few weeks but haven’t had many opportunities to get in it. Had considered buying direct to the $215 final but decided not to, but there’s only one freezeout satellite each day at 8:15pm, which I seem to forget about and miss the start much more often than not. 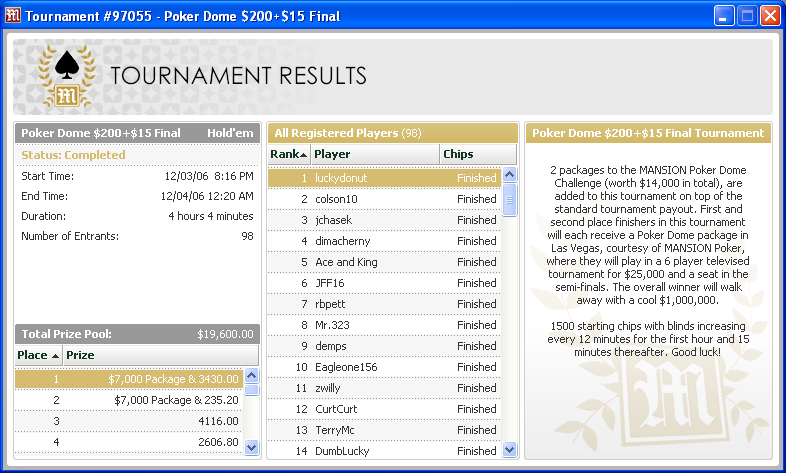 The final four played very cagey for a long time, with not many hands going to a flop. I was stealing plenty, even before that. Much more often than I usually do, but I’d recognised the need to build a big stack when only two players were going to get anything. The players eventually started to notice my relentless stabbing at blinds and began to fight back. "Quit raising the blinds" said one. Well, I’m sorry, it’s been working well for me so far. But hey, now I know you’ve finally caught up so it’s time to change gears. Well, first it’s time to get lucky, picking up KK against JJ and leaving us three handed. And I have a decent chip lead now too. With blinds at 150/300 Mr Please-don’t-raise-me pumps it up to 900 from the button. I have AQ on the big blind and about three times his stack. Here’s where I still haven’t decided whether I played the hand like a muppet or a genius. Instead of putting the pressure back on him, I decided I was far enough ahead to get a bit tricky and try and end the thing. I just call his raise, and the big blind folds. The board brings J88 with two clubs. I check and immediately call his 900 bet on the flop. I’m not sure why, but I guess I could be ahead, or I could try and outplay him anyway. I consider whether I actually have the balls to put him all on in the turn regardless of the next card but there’s hardly time before the turn brings another J and I move all-in. Again, this is either stupidity or genius, and I’m still torn between the two. I may well have the best hand, using the two pair on board and my ace high. But there’s also a high chance I’m splitting, and so the bet is only good if he will throw away the same hand or one that beats mine. He may fold an ace here, but it’s unlikely, and I’m almost certainly getting called by any hand that beats me, unless he is extremely tight and puts me on a J, then he might throw away a small full house or a bigger two pair. But can I check-fold this hand now? I don’t think I can, so I may as well bet it just in case I can get him to fold a winner. The screenshot below tells the bizarre story. I was ahead the whole way. Therefore it was genius. Clearly.